Using History to bring Jobs !! 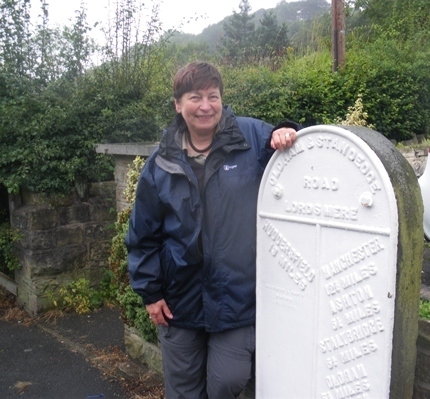 Community volunteers are setting up a Heritage Trail through the Yorkshire Colne Valley to tell residents and visitors alike about the stunning scenery and its travel history that shaped the West Riding. The Trail will attract more visitors and bring custom to the friendly inns, restaurants, shops and small businesses. There’s plenty to see, on foot, by bike or by car, with fascinating evidence of the Romans, the medieval packhorse trains, the Turnpike Trusts, the navvies who built the canal and ingenious engineering by Blind Jack of Knaresborough and Thomas Telford. But there is one section of the Trail that the volunteers alone cannot repair, the steep, ancient packhorse track from Cop Hill to Netherwood Lane, between Slaithwaite and Marsden – its surface has been reduced to rubble by the feet of generations and it is a running torrent in wet weather. The Milestone Society is co-ordinating the project which will involve the schools and Kirklees College students in the restoration work, bringing more skills to the Valley, under the tutorship of local landscape restoration professionals. Great project! Will give pleasure to many for years! Please support it! We all thought the film was excellent - captured history, walking and why you needed the money - well done, including the duck! You're local volunteers up against a big national charity - hope you win for this fantastic community project !! Please support this great community project with long lasting benefits for everyone. A terrific project! Keeping people aware of their heritage. Training people to maintain it whilst securing it's future. This track is about 600 years old, please ensure it's there for another 600. That's value for money! I wish we had heritage trails like this everywhere, not just in the Colne Valley. But it is an excellent start. Please do support this worthwhile project. Work for craftsmen, training for youngsters, and an all but permanent tribute to them and those who carved out these ways long ago. A great community project to improve a wonderful walk and bring history to life. Anyone, anywhere will be able to enjoy the Crossing the Pennines Heritage Trail - there will be a cycle version as well as by car and on foot - be part of it !!! A stunning location for families to walk; a brilliant opportunity to involve Schools and College students in restoration, for them to work with local professionals, and to add much needed skills to the area.